Saturday! 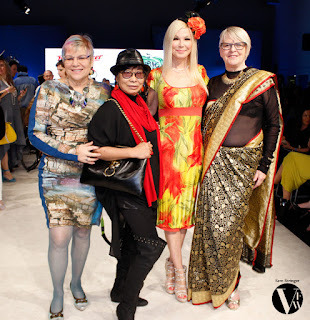 Those of us who commit to being there through all Vancouver Fashion Week (VFW) shows every day are starting to wear a bit, especially the photographers. By now they have shot literally thousands of images that all need sorting and processing. Everyone wants pics out immediately, but that just isn't possible. They are truly stretched. I personally am thankful as I could not get posts up as early as I do without their hard work and commitment to late hours and early mornings. Our emcee yesterday was TV & Radio personality Tammy-Lynn McNabb. Each brings a different way to interact with the audience. I liked it when she selected audience members to come onto the runway and be interviewed. 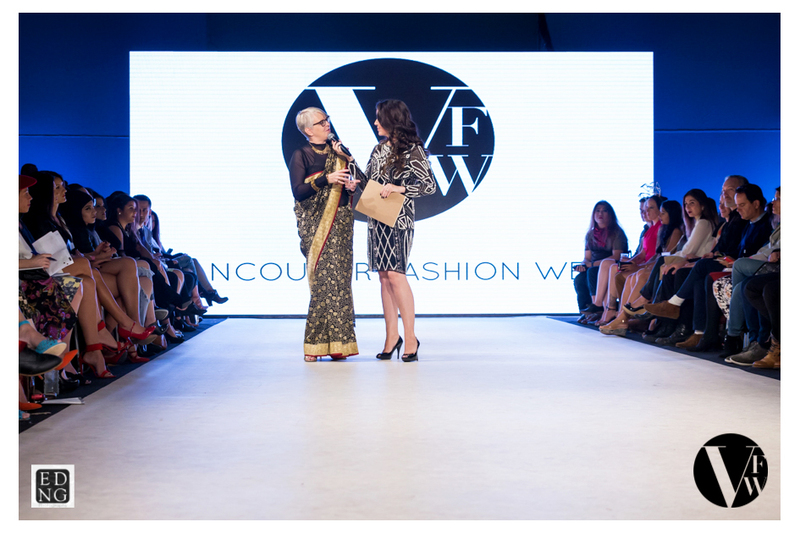 I was honoured to be one chosen to share my views on fashion and on VFW. It also gave me a chance to show off today's outfit, my lovely sari and jewelry from designer Shravan Kumar - and that brings me to today's story. I have always wanted to own a sari. When I was at Shravan's pop up shop I saw this one and it called my name. He draped it on me and when I looked it the mirror - nirvana. It was meant to be mine. I have seen sari's tied many times and was sure I could do it myself. A little review video yesterday and I was ready to get dressed. OH MY NO! I couldn't get it to lay flat and ended up looking like a pumpkin. I tripped my way into the Chinese Cultural Centre holding it up as best I could and headed upstairs to find Shravan. Within minutes he had it snug to my body and doing all the right things. I felt beautiful. A change of jewelry and a traditional mark drawn on my forehead by Shravan himself and I was ready to hit the runway. This look was a hands down hit. Now for today's highlights. Please check back for a separate article on Shravan Kumar coming in a day or two. Designer Shelley Klassen of Blushing Designs will be featured in the Buy Local article HERE. This self-named label by designer Elena Bobysheva was launched in 2013 - right after graduation from Columbia College where she earned a double degree in Fashion Design and Business Management. Her first collection was picked up by a luxury retailer after it's debut at Chicago Fashion Week. Numerous design awards followed and the label has received the coveted CFDA Approved Certificate celebrating the most promising emerging designers. e l e n a b o b y s h e v a is a contemporary womenswear label with a high-end focus that is rooted in sustainability and animal welfare. Defined by perfectly executed tailoring, attention to detail, and precision cut dresses, garments define the contemporary, feminine silhouette.. The essential components of the label is sophisticated textiles and experimentation of soft and hard geometrical lines. As a former seamstress, what struck me by this collection was the beauty of the construction. Seams were so flat they were often invisible - not easy given some of the unique cut-out and angled shapes. Great silhouettes, interesting colour blocking and very wear-able - this designer is definitely one to watch. Designer Ngono Ines is a native of Cameroon and arrived in France at the age of 16. While she studied communications and earned a MA in Brand Strategy, she has loved fashion since her childhood. While she was in school, she was also building her own women's clothing brand specializing in cocktail dresses and evening wear in silk and African textiles. In 2011, Ines showcased her first collection and in 2014 she went on to open her first store. What we saw this evening were two separate collections. One had a more European look of lovely evening wear. The second gave a nod to her ethnic roots - featuring African fabrics and accessories. While both were strong, it was the second half that captured my imagination. I was in love with so many of the fabrics and designs in this section. As both were so unique, I have image from both. All collections are available for order from her website www.ineskacreations.com, but you can also find them in her shop located in the centre of Lyon at 33 Rosemary Street 69001 Lyon. Monika has a Master's degree from the Faculty of Design and Arts Ladislav Sutnar West Bohemia in Pilsen . As a student she won numerous awards including a six-month internship in Amsterdam studio Conny Groenewegen and an intense four week internship focusing on haute couture fashion and pleating at the prestigious Fashion Masterclass in Paris. In 2014, Monika was approached by Italian company Fedrigoni, the producer of the premium creative papers, with a project to create paper shoes, which would represent the company at the Vienna Design Week 2014. These shoes - impregnated with resin - can stay immersed in water all night without loss of quality. Monika's work was a great success in Vienna, so the Fedrigoni company decided to continue to support her. For S/S 16 the designer created her first comprehensive collection of shoes, fashion accessories and clothing with the name “Thank you Marcus !“ This collection will be used to launch her professional career with the brand “Lepschy“. I have a great press release from Lepschy on this collection that I've published as a note on FB HERE! Fabrics were soft and flowing for the most part, alternated with the a harder edge leather for a couple tops. Palette included a couple shades of pale taupe and a bright poppy red. Lines were kept clean and simple - accents understated and well thought out. The collection exuded elegance. You can find Monika in her workshop at Brašnářství R. Tlustý a spol., which supports the designer in her professional development. Designer Naoko Kuroishi used to be a visual merchandiser for a Japanese fashion brand called “Emoda.” After five years with this company, she left to launch her own label - Ameri - in September 2014. The brand concept is “no rules for fashion”. Don't be dictated to. Wear what makes you happy. 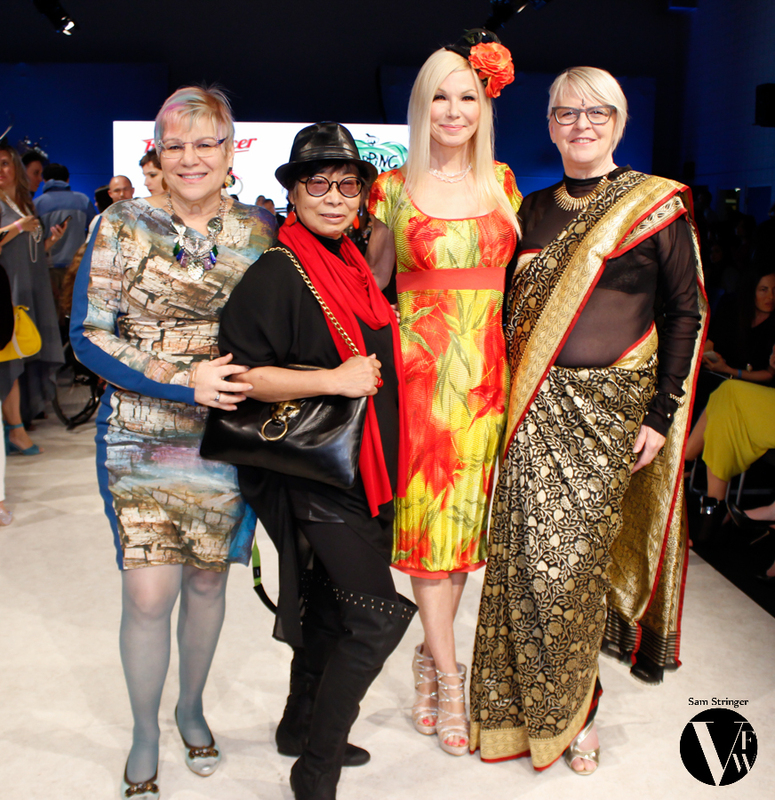 Enjoy fashion, but don't forget to incorporate your personal style. Kuroishi is also famous as a blogger and on Instagram in Japan. I was very taken with this show. Tim Gun is often heard to say Edit, Edit, Edit. As much as I love complexity, sometimes it is simplicity that hits just the right note. This collection had strong lines, beautiful fabrics, a gentle palette and utterly beautiful tailoring. No gimmicks or tricks - just fabulous design work. It takes great talent to make designs look so effortless. The feel was casual, yet elegant. These classic and timeless additions will never go out of style. Kudos to the designer. I am a fan.